Spent the last few days in Dharamsala, northern India. 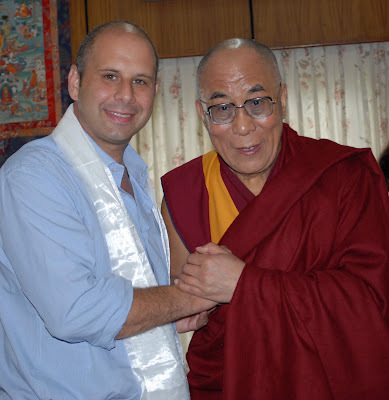 And was lucky enough to have a 45 minute meeting with the Dalai Lama yesterday. We spoke about Tibet, Afghanistan and life. I can’t ever remember encountering such a gentle and sincere man. In the far north of Pakistan the Himalayas rise up into the heavens, the rooftop of the world. The air is so clear that you can see for a thousand miles, and the scent of the valleys is the scent of freedom. The first time I saw those colossal peaks, it was from the cockpit of a Fokker-27, flying between them in air so thin that the tips of my fingers went numb. We landed at Chitral and drove and drove up mountain tracks no wider than an axle’s length. We found villages clinging to the slopes, fir trees alive with birds, glistening streams, and children squinting in the winter sunlight. I thought I’d discovered Paradise. In one village I was taken in and given tea. My host was a man called Attar Khan. He was one of those men whose face mirrored the hardship of his life. His skin was like a sheet of ox leather. But his smile, which never wavered, reflected a serenity, a contentment. Attar Khan boiled up some water from the stream, thanked God for sending guests to him, and poured the first cup of tea. It was sweet, tasted as if it had been smoked through nights and days. I praised the flavour and asked about life in the mountains. I told him that I had come from a place called London, a city where lives were sometimes swallowed up by stress. Attar Khan smoothed a hand down his grey beard. ‘Not Jinn, but engineers,’ I replied. I asked if foreigners ever visited the valley where Attar Khan lived. Again, he pressed down his voluminous turban. Attar Khan stroked his beard again. ‘That was the strange thing,’ he said. ‘You see, they wanted to climb up the mountains. We asked them if they were looking for markhor or other game, but they waved a finger and said they had come to climb the mountains for the sake of climbing the mountains. We were confused. You see, here at Gilgit we only climb the mountains when we have a reason to. And your people, the ones who came, thought it made sense to climb the mountains for the sake of climbing them. Attar Khan poured me a second glass of tea, broke open a pomegranate.